The DOE’s Paducah site in McCracken County, Kentucky, is approximately 10 miles west of the city of Paducah. Within the 3,556-acre site is the Paducah Gaseous Diffusion Plant (PGDP). The PGDP consists of over 500 facilities, with 19 miles of roadway and 5 miles of fence. PGDP was constructed in the early 1950s as a uranium enrichment facility to support the fabrication of fuel assemblies for commercial and military nuclear reactors and military weapons. Four large cascade process buildings that enriched uranium by the gaseous diffusion process served as the hub of the PGDP until the commercial uranium enrichment process was terminated in July 2013. The U.S. Enrichment Corporation (USEC), a private company, handled commercial operations until 2013; DOE retains primary control of the facilities. Past PGDP operations generated hazardous substances, some of which were released into the environment. Spills, leaks, and other releases allowed large quantities of contamination to reach the regional groundwater aquifer. In 1988, environmental monitoring and investigation began at PGDP and identified contaminant plumes that extended off site. Primary contaminants are TCE and the radionuclide technetium 99 (99Tc), an element with a half-life of over 200,000 years. PGDP demonstrates several complexities including extensive plumes, multiple long-lived contaminants and contaminant sources, heterogeneous geologic conditions, and off-site contaminant migration. The main technical complexities include DNAPLs, multiple contaminants (VOCs and 99Tc), challenging geological heterogeneity (lower permeability fine-grained sediments in the vadose zone and shallow groundwater), and an important aquifer (Figure 43). Figure 43. 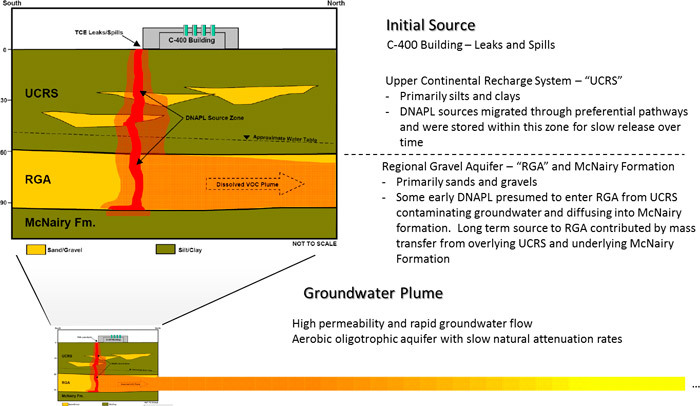 Simplified depiction of primary PGDP groundwater contaminant source (C-400 Building) showing the fine over coarse lithology, DNAPL, and the resulting slow-release challenge (DOE 2010a). Site geology significantly limits the performance of remedial technologies and is representative of many contaminated sites. At PGDP, the lower permeability Upper Continental Recharge System (UCRS) overlies a higher permeability Regional Gravel Aquifer (RGA). VOC contamination moves downward through the UCRS and feeds into the RGA. Some VOCs migrate through relatively direct transport pathways and enter the RGA in concentrated form as DNAPL. DNAPL can continue to migrate downward in the RGA, coming to rest at the McNairy/RGA interface. A significant amount of contamination is also retained in the silts and clays of the UCRS. Thus, the overlying UCRS vadose zone and the underlying RGA-McNairy interface act as a contaminant reservoir that slowly discharges (like a capacitor or a battery) over a long time into the flowing groundwater aquifer. Once contaminants dissolve in the RGA, they rapidly move downgradient toward the Ohio River. A groundwater project team was formed, which included DOE, USEPA, and the Commonwealth of Kentucky Department of Environmental Protection (KDEP). The team is supported by technical resources from universities, national laboratories, and contractors. This team currently works together to address PGDP groundwater contamination. In response to the site-specific complexities, the team’s approach has focused on source removal from the UCRS (and RGA), hydraulic capture, and long-term MNA. Remedial activities include two groundwater P&T systems, thermally enhanced extraction as an interim action, and research studies to quantify natural attenuation. Groundwater under the PGDP site is contaminated by VOCs, primarily TCE (Figure 44) and 99Tc. Facility operations began in 1952 and released TCE into the subsurface. Diffusion of the high-strength contamination into less permeable zones over many decades “loaded” contaminants into these zones, forming secondary sources that continue to slowly “unload” long after the primary contamination source was removed. The area that includes the C-400 Cleaning Building and nearby facilities (such as the former cylinder drop test area and burial grounds) coincides with the highest TCE concentrations and comprises the centroid of the groundwater plumes at PGDP (Figure 44). This area is the dominant historical and current source of TCE solvent contributing to the PGDP groundwater plumes. The subsurface near the C-400 Cleaning Building (Figure 43) has three relevant hydrogeologic zones: (1) the UCRS, about 0-65 feet deep; (2) the RGA, about 65-87 feet deep; and (3) the underlying McNairy Formation, which is greater than 87 feet deep. Groundwater (the “water table”) is at a depth of about 34 feet and occurs within the lower UCRS. Near the C-400 Building, DNAPL was identified both above and below the water table in the UCRS, in the RGA, and in the upper portion of the McNairy Formation (Figure 43). Following downward transfer of TCE from the source zone into the UCRS, the dissolved-phase plume is transported laterally, primarily in the RGA, by groundwater flow. The RGA is much more transmissive than the overlying UCRS or underlying McNairy Formation. Several innovative technologies were tested at PGDP and promising technologies were deployed at full scale. Progress toward site objectives for PGDP groundwater has been achieved through a combination of standard and innovative technologies. Groundwater remediation at PGDP is part of a larger environmental effort that also addresses contaminated soil, sediments, and former burial grounds. The process for managing these activities is governed by a 1998 Federal Facilities Agreement (FFA) negotiated between DOE, USEPA, and the Commonwealth of Kentucky. The FFA defined a set of consistent requirements for comprehensive site remediation in accordance with RCRA and CERCLA. Under the FFA, an outline was established to achieve remediation targets and work toward achieving site objectives. Remediation targets and overall site goals are described in the annual Site Management Plan (SMP), End State Vision, and related documents. Early responses to contaminated groundwater focused on mitigating and eliminating potential exposure pathways. DOE placed areas with contaminated drinking water wells on an alternate water supply. In 1993, DOE prepared two RODs to address contaminated groundwater. A key early action was to install P&T systems on two major PGDP plumes, the Northwest and the Northeast Plumes. These systems were constructed and placed into operation in 1995 and 1997, respectively. The P&T systems have stopped the two plumes from spreading and have substantially reduced the amount of contamination migrating towards the Ohio River. Periodic adjustments were made to optimize the P&T systems over time. For example, in August 2010, the Northwest Plume P&T system was modified by installing two new recovery wells and taking two other wells offline to refocus the recovery zone and to increase contaminant mass removal. Following optimization, the system is projected to recover more than 90% of the mass discharging from the C-400 Building source area. Optimization of the Northeast Plume P&T system is ongoing. Any future modifications to the P&T system (for example, pumping rates, extraction well locations, collateral impacts, and shut-down criteria) will be determined by the core team based on monitoring data, groundwater modeling, and applicable regulations. Figure 44. TCE plumes at PGDP (DOE 2015c). Innovations related to hydraulic control of groundwater have included strategies for system optimization (for example, pumping locations and treatment processes), and improved methods for characterization, monitoring and modeling/visualization. Removal of primary and secondary sources near the C-400 Cleaning Building has been a primary focus of groundwater project team. Several innovative approaches were tested to determine whether they could effectively remove contaminants from the lower permeability UCRS, the most contaminated areas of the RGA, and the underlying McNairy Formation. Two promising removal technologies, electro-thermal and thermally enhanced steam injection, were tested as pilot projects and deployed at production scale to reduce the source term. These two technologies were useful in removing source contamination from the UCRS, thus limiting future mass discharge to the RGA. In the 1990s, Monsanto, General Electric (GE), and DuPont developed an electro-thermal remediation process (Lasagna) that applies electrical energy to the subsurface to accelerate contaminant removal and destruction. Lasagna creates an electric field underground via the installation of layered anode and cathode electrodes. This electric current creates osmotic gradients that induce the movement of water through defined treatment zones containing a treatment material such as zero-valent iron. The electric current also heats the soil (through resistive heating), which mobilizes contaminants for treatment or collection. Pilot studies for this technique were deployed in 1995 and 1996 at the Cylinder Drop Test Area (SWMU 91). The pilot studies demonstrated an average TCE removal effectiveness of 95%. The pilot studies also identified several advantages of the method: reuse of infrastructure, minimal or no extraction equipment needed, and low O&M costs. The system was installed using a sheet pile technique that generated minimal wastes. Lasagna was selected as a full-scale remedy for source area TCE at SWMU 91 and operated for two years following deployment (from 1999 to 2001). The technology was applied to approximately 10,000 cubic yards of low-permeability contaminated UCRS soil containing up to 1,500 mg/kg TCE (indicative of DNAPL). Pilot and full-scale systems reduced TCE soil concentrations from 1,500 mg/kg to 4.5 mg/kg; average TCE soil concentrations were reduced from 84 mg/kg to 0.38 mg/kg. The full-scale technique was more than 90% effective in reducing source TCE, achieved regulatory objectives, and reduced costs by approximately 1/3 compared to identified alternatives. Electrical resistive heating (ERH) was identified to remediate the primary and secondary source contamination associated with Building C-400. This technology heats the subsurface by applying an electric current between electrodes networked in the target volume. Heat is generated from the resistance to current flow, which increases the vapor pressure and volatility of solvents such as TCE. Volatilized contaminants are then captured using soil vapor extraction (SVE) wells along with groundwater/steam extraction wells. In 2003, PGDP performed a successful small-scale pilot test of ERH and demonstrated that significant amounts of TCE mass could be removed from both the UCRS and the RGA near Building C-400. However, the high hydraulic conductivity in some portions of the RGA (about 425 feet/day) limited the ability to heat the base of the aquifer because the inflow of water. The pilot test results highlighted the need to carefully design ERH for PGDP to make sure that all parts of the RGA could be heated to target temperatures (especially the RGA-McNairy interface in locations, where TCE penetrated to the bottom of the RGA and into the upper portion of the McNairy). Contribute to the final remediation of the Groundwater OU by removing a significant portion of the contaminant mass of TCE and other VOCs at the C-400 Cleaning Building. Reduce the time that TCE concentration in groundwater remains above the MCL, and meet the statutory preference for attaining permanent solutions through treatment. Satisfy the requirements set forth in 40 CFR 430(f)(1)(ii) for interim measures that will become part of the total remedial action that will attain ARARs. As an interim measure, it is not expected to meet MCLs. Be cost-effective, based upon the estimates available at the time of the ROD. Permanently remove a significant portion of TCE near the C-400 Cleaning Building area through treatment. Hazardous substances, pollutants or contaminants will remain on site at levels precluding unlimited use and unrestricted exposure. Meet CERCLA’s preference for remedies that employ treatment as a principal element of the remedy and permanently and significantly reduce toxicity, mobility, or volume of hazardous substances, pollutants, or contaminants. To ensure optimum performance, the ERH interim action for the VOC source removal near the C-400 Cleaning Building was performed in phases. In 2010, Phase I heated two highly contaminated areas of the UCRS near the C-400 Cleaning Building and a less contaminated area of the RGA adjacent to the southeast corner of the C-400 Cleaning Building. A postoperational review of Phase I ERH performance found that ERH had effectively heated the UCRS and removed the associated source VOCs. However, Phase I data from the RGA indicated that ERH underperformed in the highly permeable formation and did not heat to target temperatures in the lower part of the aquifer. Based on the Phase I data, the PGDP groundwater project team recommended proceeding with ERH in the highly contaminated UCRS near the southeast corner of the C-400 Cleaning Building (Phase IIA) and developing an alternative approach to address the significant RGA contamination in that same area (Phase IIB). Phase IIA ERH treatment in the UCRS was performed and completed in 2014. Two alternative technologies are being considered for Phase IIB: in situ chemical oxidation (a chemical destruction method) and steam enhanced extraction, which is a thermal method that will likely work better than ERH for permeable aquifers. Preliminary plans for both alternatives have been developed. A treatability study of steam injection to assess the viability of the technology for Phase IIB has been completed, and results are being evaluated by the groundwater project team. Finally, a separate CERCLA remedial action is underway to remediate VOC sources associated with a 2.2-acre former oil landfarm area. Deep soil mixing was the remedy chosen for the landfarm area. The source removal/treatment makes use of an eight-foot-diameter auger to mix soil to a depth of roughly 60 feet in the remedial area located in the southwestern part of the site’s fenced boundary. Steam will be injected through the auger; volatilized TCE will be recovered at the surface and captured in a treatment system. Soil will be mixed, and 0.5 to 2.5 % (weight) zero valent iron will be added to address residual VOC contamination. 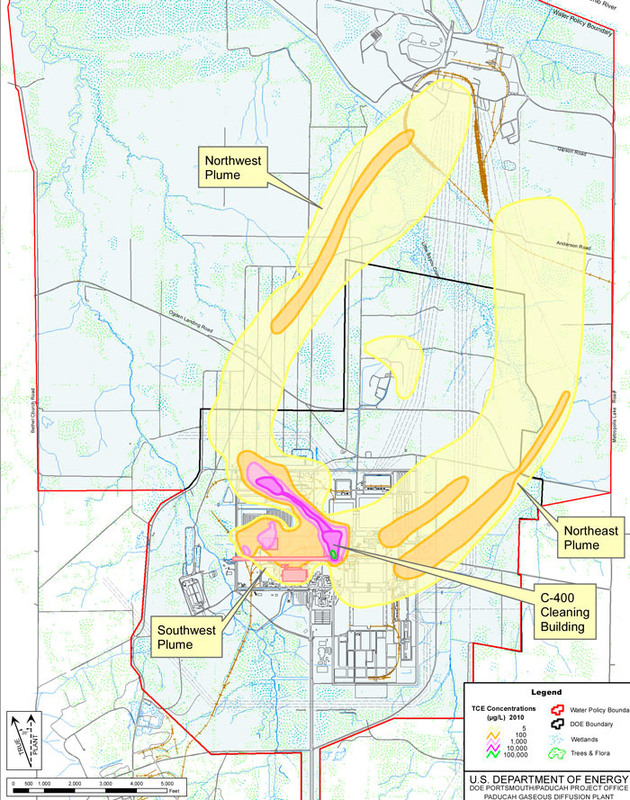 Based upon current information, most known VOC source material will have been removed from PGDP soil and groundwater following completion of all phases of this interim action and related decontamination and decommissioning activities for the C-400 Building, implementation of Lasagna at SWMU 91, and soil mixing at former landfarm area. Coupled with hydraulic control and source removal, MNA is integral to effective long-term environmental management of the PGDP groundwater. In 2007, a TCE fate and transport project scoping team (including regulators, DOE, and technical support organizations) was assembled to coordinate the study of TCE migration and controlling processes in the groundwater at PGDP. This team focused on the important site-specific degradation and attenuation processes that impact TCE fate in PGDP plumes and TCE degradation rates for these processes. Recent and emerging data from diverse sites across the United States (such as the Test Area North Site at the Idaho National Laboratory) suggest that co-metabolism can be a significant TCE degradation mechanism in aerobic oligotrophic (low nutrient) contaminant plumes such as PDGP. The PGDP aerobic co-metabolism assessment was conducted in the Northwest Plume. This assessment was based on enzyme activity probe (EAP) assays supplemented by multiple lines of supporting evidence, including molecular characterization techniques, stable carbon isotope analysis, and geochemical measurements for ten RGA wells that are located along the plume centerline and two control wells located outside the footprint of the Northwest Plume. The various EAP assays each provide a clear, definitive fluorescent signal if a certain oxygenase enzyme is active at the time of analysis. The assays test either for the enzyme that oxidizes methane (soluble methane mono-oxygenase, sMMO) or for one of a suite of enzymes that oxidize aromatic compounds (for example, toluene oxygenases). The specific enzymes that are targeted with EAPs are representative of those documented to break down TCE. These enzymes result in degradation and subsequent mineralization of TCE to end products such as carbon dioxide and chloride ions. If detected, the enzymes are active and capable of co-metabolic degradation of TCE. Bacteria capable of aerobically biodegrading TCE are present in the Northwest Plume. The number and distribution of bacteria appear sufficient to contribute to TCE biodegradation in RGA groundwater. The microbial community appears to be stable and sustainable. Previously estimated degradation rates for PGDP are consistent with the published literature for aerobic co-metabolism in large aerobic plumes, with a half-life in the range of 9 to 25 years. A site-specific study of degradation rates was recommended. The overall objective for PGDP groundwater is to remove/mitigate ongoing sources and remediate to below target concentrations of contaminants. Toward this end, DOE and supporting contractors have made extensive efforts to control the migration of contaminated groundwater and to identify, investigate, and remediate sources of groundwater contamination. A successful approach for PGDP groundwater, like other large complex sites, requires a combined remedy that employs several technologies synergistically to effectively achieve remediation objectives. At PGDP, technologies focused on hydraulic control (groundwater P&T), source removal/destruction (Lasagna, ERH, chemical oxidation or steam enhanced extraction, and deep soil mixing), and natural attenuation. Remediation efforts to date have removed significant VOC contaminant sources and partially mitigated the migration of the groundwater plumes. Efforts continue to understand and control both VOCs and 99Tc plumes. For example, a preliminary study of the potential VI into nearby structures was recently completed; this study deemed that the VI pathway is incomplete due to the low-permeability UCRS separating the groundwater plume from receptors. Additional studies of the downgradient seep areas (along Little Bayou Creek) are planned to better understand the distal portions of groundwater plumes. Finally, actions are planned to stabilize remaining burial ground areas (continuing through the mid-2020s). These activities will further reduce potential sources and impacts to PGDP groundwater. Table 19 provides an estimate of TCE mass removed by the various remediation actions through March 31, 2015. *VOC values are primarily TCE and include liquid VOCs and VOCs on carbon. **Cumulative through December 31, 2014. ***No remedial action tabulated to date. Remediation of PGDP groundwater contamination involves both innovative and standard technologies that target contaminant sources and the plume. Standard groundwater monitoring, supplemented by special studies, is used to identify technologies, design treatment systems, and monitor remedial progress. The PGDP groundwater project team and DOE have focused on periodic optimization, for example, making several adjustments to the groundwater treatment system in the early 2000s to increase efficiency. Additional improvements to the existing hydraulic control (P&T systems) to better control the potential for off-site migration of groundwater contamination are in progress. In the case of ERH, a phased implementation was used to help determine whether the technology could effectively treat the permeable RGA. Based on the data collected during Phase I, the treatment technology for Phase IIB is being modified to provide improved performance in a highly contaminated lower portion of the aquifer. PGDP has employed a combined remedy approach that provides hydraulic control, source removal, and natural attenuation. The technologies selected include both standard and innovative approaches. A key, site-specific complexity that the selected technologies must address is the geologic setting of a low-permeability interval overlying a highly permeable regional aquifer. In some cases, a different technology is needed for the near-field vadose zone and shallow groundwater versus the deeper regional groundwater. Based on these conditions, the PGDP groundwater project team has prioritized interim actions that focus on source removal to reduce the future reservoir of contamination feeding the RGA. Since the initial discovery of site contamination, DOE, USEPA and the Commonwealth have worked with the community to develop a long-term remediation plan for the site. Outreach efforts have included public notices, interviews, and public meetings. PGDP representatives have also held environmental workshops to inform the community of any upcoming public meetings about proposed future remediation plans for the site. DOE also commissioned a Citizens Advisory Board (CAB), which meets monthly to discuss remediation activities and potential health issues associated with past operations and disposal activities at the site. The purpose of the organization is to keep local citizens up to date on site remediation progress and related issues. Both USEPA and KDEP participate in CAB activities. Through the Federal Facilities Agreement and groundwater project core team, DOE and PGDP contractor/support organizations work with regulators and stakeholders to address soil and groundwater contamination and to develop a risk-based end-state goal for the site.